We’re celebrating mums and music this Mother’s Day! Do you and your mum share a special favourite song? 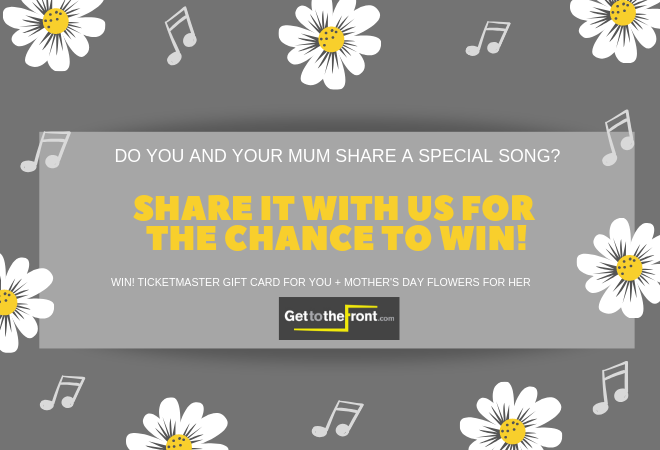 Tell us what it is for the chance to win a £30 Ticketmaster Gift Card for YOU and Mother’s Day flowers for HER! To stand the chance of winning simply head to our Twitter, Facebook or Instagram to enter before the competition ends at midnight on 24 March 2019. These terms and conditions apply to the GetToTheFront.com Mother’s Day Giveaway and entry to the giveaway is in acceptance to these terms and conditions. The Promotion is only available to UK residents only who are over the age of 18. The winner will be sent out 1x £30 Ticketmaster Gift Card via email and 1x flower delivery in the post to a specified address. The competition winner will run until midnight on 24 March 2019 and the winner will be notified via the GetToTheFront social media channels on 25 March 2019. The winner will have 24 hours to claim their prize, after which another winner will be selected. Entries made by previous winners of GetToTheFront.co.uk competitions within the last 6 months will be deemed invalid. GetToTheFront.com’s decision in respect of all matters to do with the Promotion will be final and no correspondence will be entered into. It should be known that the giveaway may be promoted across all the GetToTheFront.com social media platforms (Twitter, Facebook, Google Plus and Instagram), entries will only be able to be made on Twitter, Facebook and Instagram.